You already know the benefits of block scheduling! Setting it up in drchrono is easy, and can be accomplished by following the steps below! Hover over "Schedule" at the top and click "Appointment Templates". Click the "Add New Template" button in the top right. 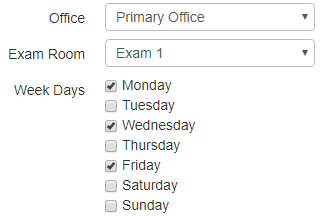 Select the Office, Exam Room, and Week Days that you want the block to be created for. Next, choose the start date, end date, time, and Telemedicine Appointment Profile. When finished, click "Create". Tip: You can create as many custom appointment templates as you'd like.